Product information "Roll-through scale RSI MC"
They are ideally suited for weighing small mobile containers (e.g. in a laundry, wire cage trolleys, container trolleys, transport trolleys, roll containers or waste containers, etc.). These roll-through scales are often used as laundry scales for weighing laundry trolleys. The raised sides prevent the roll containers from falling off. 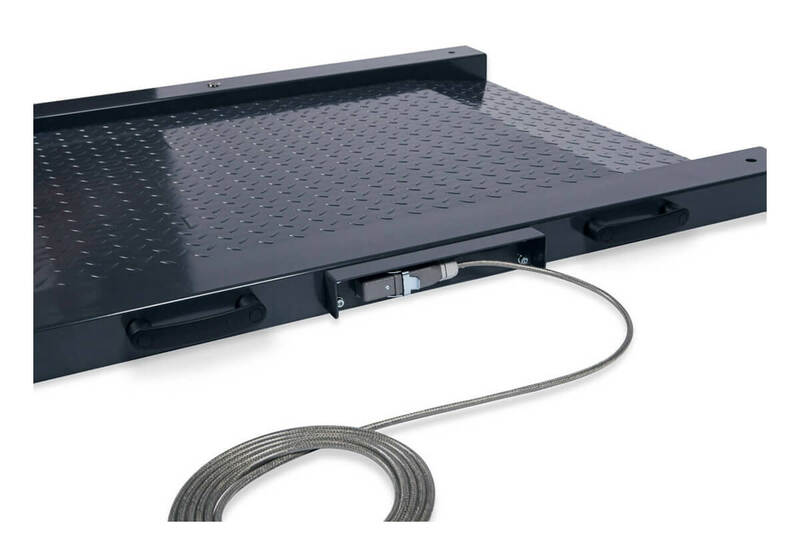 The combination of the weighing platform with the high-quality multifunction indicator MWI is intended for complex weighing operations in legal for trade and non-legal for trade applications. Operation of the device via the membrane keypad is intuitive and easy to learn – even for untrained staff. 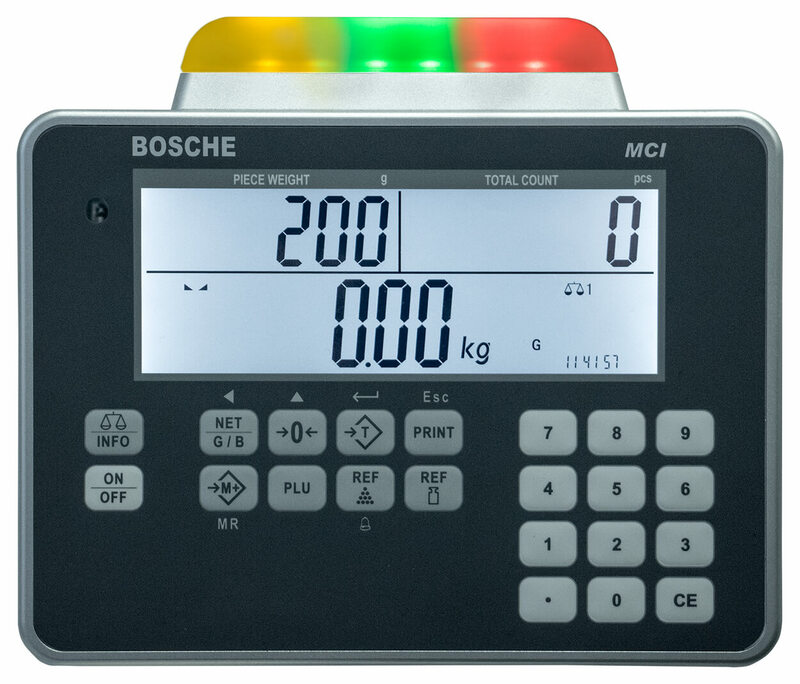 A tare weight can be entered using the numeric keypad (known weight of the roll container) so that the scales then show the net weight. The scale can be easily transported with the transport rollers and handles with and re-erected. The platforms are fitted with four high-quality load cells. The counting display MCI is equipped with three illuminated displays for weight, piece weight and quantity. Numerical keypad for setpoint value input (piece weight, quantity, tare). The floor scales are supplied for mains operation as standard (mains plug included). 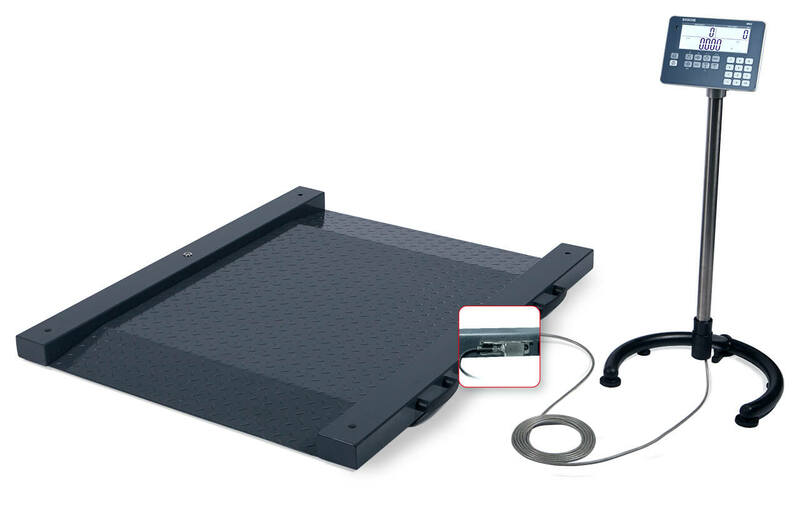 The extremely flat weighing platform made of powder-coated steel provides an exceptionally durable, non-slip surface. It is fitted with four laser-welded load cells. 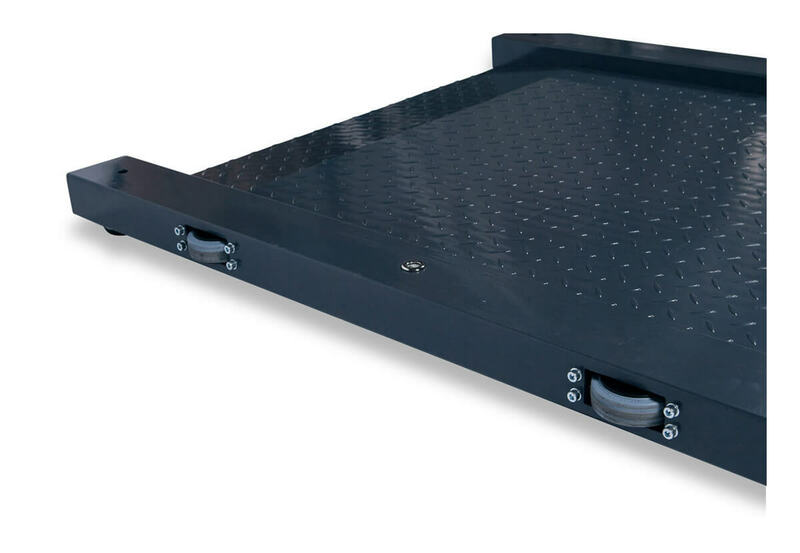 The short, flat access ramps are integrated in the weighing platform. This allows the scales to be loaded manually with little effort. The extremely robust design has an increased load-bearing capacity and rigidity. As with all BOSCHE scales, all the cables and load cells are laid in the frame and therefore protected against damage. The platform is connected to the indicator MWI by a 5 meter steel-sheathed cable (a longer cable connection can be used for non-verifiable scales). 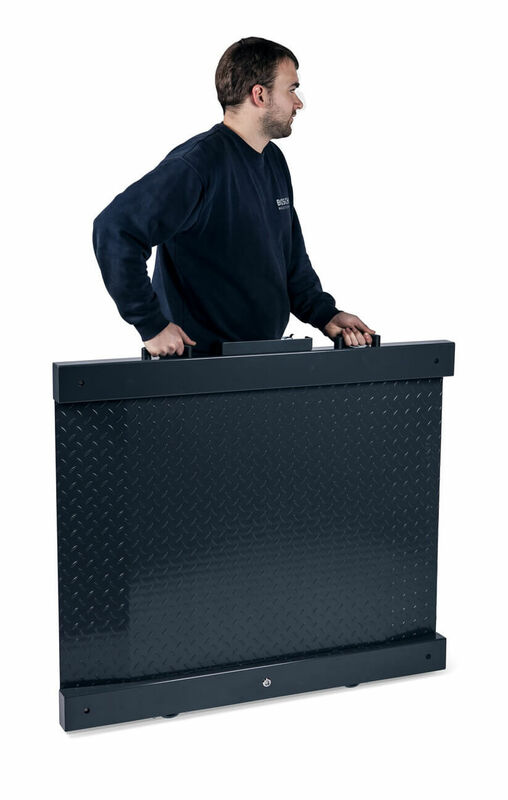 Standard sizes (without ramps and side guards) are 800 x 800 mm, 1,000 x 1,000 mm or 1,200 x 1,200 mm. Related links to "Roll-through scale RSI MC"
Our comment on "Roll-through scale RSI MC"
The MCI is a powerful counting indicator, which is suitable for complex counting applications. The display is a sturdy, user-friendly device, which functions are easy and fast to understand. As data is displayed on 3 LCD displays, the operator has all the most important information available at a glance. The adjustable backlight guarantees an optimal readability, even weith unfavorable light conditions. An intuitive operation via the comfortable foil keypad with 22 keys allows even untrained staff an easy handling. Via the numeric keypad it is possible to input reference quantity - piece weight. At check weighing setting limits is therefore very easy. Thanks to the great flexibility of this device, we are able to cater to the requirements of nearly all customers. You can connect up to 2 weighing platforms. You can therefore have a counting system with two platforms, one with the reference scales and the other with the counting scales. Piece Counting - The high internal resolution (1:1,000,000 parts) provides a precise determination of the piece weight. Automatic reference weight updating - the counting indicator can continuously recalculate the piece weight thus no counting errors occur. Summing / addition of units of up to 9,999 weighings. The display is powered by a wall power supply (100-240V/50-60Hz) as standard. We offer an optional integrated battery, which allows operation for up to 15 hours. The battery takes 20 hours to charge. The adjustable, automatic switch-off feature saves power and conserves the battery. The weighing terminal comes with a serial RS-232 interface as standard, which permits bidirectional connection to a scanner/barcode reader, printer, PC or second display. This allows you to print a customer-specific, verifiable document that contains the Alibi number, date and time. One of our signal lamps (traffic lights) can also be controlled via this interface. These can make quality control easier from a visual perspective. An optional, additional scale interface enables the connection of a second weighing platform.